A Trump Table For Your Front Room? Home > Blog > News > A Trump Table For Your Front Room? 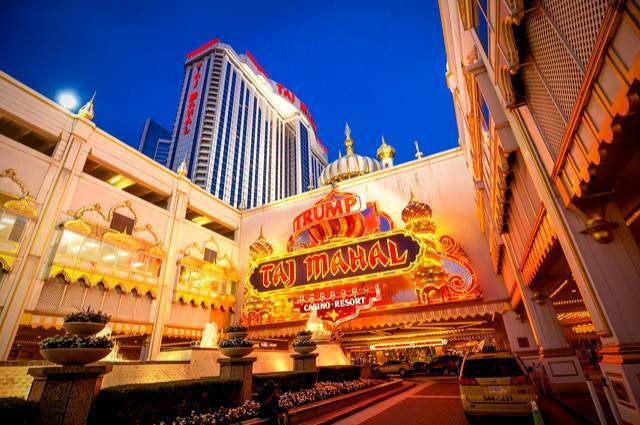 Would you have a table from Trump’s Taj Mahal casino? The Trump Taj Mahal casino, Atlantic City NJ: referred to as the Eighth Wonder of the World by the present-day President of the United States. Now, Hard Rock International wants to rid the casino of any momentoes of his ownership. Image by F11Photo (via Shutterstock). “Place your bets, please…” what are the odds of getting a Donald Trump table over to the Republic of Ireland without punitive shipping charges? We shall let you draw your own conclusions. Lovers of kitsch, bad taste furniture (last seen in a 1987 Argos Catalogue), or anything by the President of the United States were in for a treat last weekend. National Content Liquidators held an auction of furniture and fixtures from the Trump Taj Mahal casino in Atlantic City, New Jersey. Sold under instruction of The Trump Organization, the sale began at 10 am on Thursday. Lots included bedroom furniture, sold individually or as a package; bar stools and tables; a reception table or thirty; and various kinds of sofa. Also lamp posts and murals. Which is fine if you enjoyed your stay at the Trump Taj Mahal. As to why the auction came about, the Trump Taj Mahal (hailed by Donald Trump himself as ‘The Eighth Wonder of the World’ on opening in 1990) is changing hands. Hard Rock International will be the new owners of the Atlantic City casino. The ‘Eighth Wonder of the World’ had had breached US money laundering regulations 106 times over. Well, as they say, “whatever floats your boat”. Would we have a Trump table or a bar stool in our humble abode? We prefer to do our own tables and bar stools, thank you very much. Plus the shipping costs would be exorbitant. Steven Cleary Carpentry, 10 July 2017.